Intergovernmental Forum leaders meet in Whitehorse. Caption: Intergovernmental Forum leaders meet in Whitehorse. 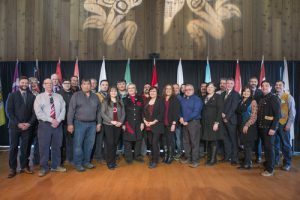 Federal Minister of Indigenous and Northern Affairs Carolyn Bennett, along with Yukon Premier Sandy Silver, Council of Yukon First Nations Grand Chief Peter Johnston and Yukon First Nations chiefs met today at the Intergovernmental Forum in Whitehorse. Thursday’s meeting provided an opportunity for governments to provide updates on common priorities including reconciliation initiatives, the Truth and Reconciliation Commission’s Calls to Action, Missing and Murdered Indigenous Women and Girls, and Bill C-17 to amend the Yukon Environmental and Socio-economic Assessment Act (YESAA). Various intergovernmental fiscal matters were a key discussion item and a presentation on the Arctic policy framework rounded out the meeting. All parties are encouraged by progress made to date and that dialogue is continuing on key issues. “Today’s meeting with ‎Yukon First Nations chiefs, Grand Chief Johnston and Premier Silver builds on our strong commitment to reconciliation. The Yukon is an inspiration and an example of‎ the transformative change that can be achieved when we work together. I’m encouraged by our collaborative relationship and what we‎ are ‎able to accomplish when we work in partnership. We have come a long way together and I look forward to the work ahead”. Yukon is home to 11 First Nations with completed land claim and self-government agreements, approximately half of all such agreements in Canada.